In 2019, we’re going to be happy and healthy! Here are some tips on where to go, what to do, and what to eat to be your best YOU this year! Luckily, our Air-Tan salons are all close to an exercise studio of some kind. Our Downtown salon has Pure Barre Indy just around the corner where they host classes to work every single muscle in your body. Our Broad Ripple salon also has a Pure Barre right across the street as well as The Yoga Studio two doors down. In Fishers, we have fans of Barre Code which is similar to Pure Barre. Barre Code has amazing, welcoming instructors and is a great way to get going in the morning! Our newest location in Greenwood will be in the same lot as Orangetheory Fitness and Club Pilates! SO… you have options! Eating right is also a huge part of taking care of your body, mind and soul! Researching a meal plan that fits your needs and lifestyle is the best. As a rule of thumb, however, drink more water, consume less sugar, and avoid processed foods! Whenever you have a choice at meal time to choose a salad or chicken tenders with fries, make the right choice – the salad. Both exercise and a clean diet are huge parts of being happy and healthy, but there are a few things outside of that that contribute! You want to take care of your mental health also. Make sure you get plenty of sleep, take some time to yourself when needed, and get an Air-Tan to get that little boost! If you have any questions or want to book an appointment, give us a call! 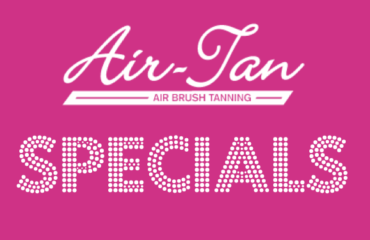 Stay Tan all Summer Long with our Awesome Air-Tan Deals!